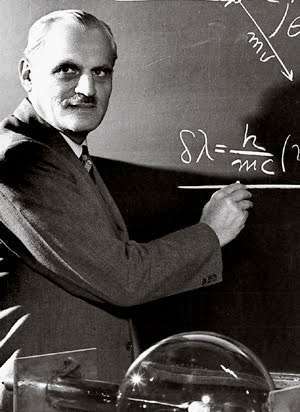 Biography of Arthur Compton (1892 – 1962) - Robolab Technologies Pvt. Ltd.
Arthur Holly Compton was born on September 10, 1892, at Wooster, Ohio, USA. His father Elias Compton was professor of Philosophy at Wooster College, Oxford, in Ohio, and also served as priest in the church there. Arthur, the youngest of three brothers and a sister, was brought up in religious atmosphere at home. His sister Mary married a missionary. They worked and settled in Allahabad, India. Arthur’s eldest brother Karl Compton was a physicist, who had written many papers. Besides, he had done considerable research on photo electricity and the crystal structure. He was appointed president of the Massachusetts Institute of Technology (MIT). Another brother, Wilson Compton, gained reputation as a good economist and able administrator. Their mother, Otelia was a doting mother and had raised the children with utmost care and attention. She was their guide and toiled for her children. She was aware of her children’s activities and took care to ensure that they did no wrong. The children too reciprocated and were aware of her contribution in their progress. Probably this was the reason that in October 1932, Wooster College of Ohio honoured 74-year old Otelia Compton as the best mother. In presence of her three sons and husband, she was conferred the honorary degree ‘Doctor of Law’. She was proud of her three sons, who had made important contributions in their respective fields towards the progress of the country and the development of the world. Compton was curious about science from an early age. Initially, he developed interest in aeronautics. He had studied deeply the theories and practical aspects of airplanes. He had even constructed and flown a glider. But later, he was attracted towards astronomy. He had another interest. He would attend any lecture by experts in the town and try to understand it. With his homebuilt telescope he would stargaze for nights together and note his observations. He would photograph the planets and then study them. Actually, he was following Karl’s footsteps. All three Compton brothers graduated with honours from Wooster College and earned their Ph Ds from Princeton University. They were all good athletes in college. When Arthur was a college student, he had invented the gyroscopic technique to control an aircraft and got it patented. He wanted to study Mechanical engineering, but when he saw Karl opting for mathematics and physics, he discussed it with him and finally decided to follow him. He got his doctorate in 1916. He worked as instructor in physics at Minnesota University for a year. Then he joined Westinghouse Corporation at Pittsburgh as research engineer. During his two-year service, he worked on development of aviation equipment for American Signal Corps. At the end of World War I, he decided to return to academic field. He accepted a research scholarship at the Cavendish Laboratory, Cambridge University and worked with great scientists like J J Thomson and Ernest Rutherford. He got trained under such greats during this period. Compton returned to America in 1920 and joined the University Washington at St. Louis as professor and head of physics department. Soon, he was invited at Chicago University. He worked under the chairmanship of Professor Michelson, as head of the physics department. He stayed there for 22 years. He was successful in roping Robert Millikan as the chairman of the physics department. He was attracted towards the important scientific researches of this great scientist and got interested in the basic research. He also got involved in the in-depth research in nuclear physics. He observed and explained the change in the wavelength of X-rays when they are deflected by electrons. Known as the Compton effect, it is caused by the transfer of energy from the photon to the electron. Its discovery in 1922 confirmed the dual nature of electromagnetic radiation as both a wave and a particle. It also went on to prove that the wavelength of X-rays could be increased. Scientists readily accepted this important discovery. In 1927, Compton was awarded the Nobel Prize for his work on scattering (deflection) of X-rays by electrons. He shared the prize equally with CTR Wilson who was awarded the prize for his discovery of the cloud chamber. Now his attention was drawn to the cosmic rays. He had in 1913 tried to learn about the nature of cosmic rays and conducted research to understand them. He formed a group of scientists to unravel the mysteries of cosmic rays. Such eight groups worked all over the world, to gather information about cosmic rays. They worked in different regions like Arctic, Equatorial, Asia, Europe and South American Regions. For Compiling and assessing the results, Compton traveled nearly 50,000 miles or about 80,000 kilometers. Till 1939, Compton was not much interested in uranium or nuclear fission. But with the discovery of cyclotron by Lawrence and its subsequent scientific and medical application, Compton directed his interest towards it. On the other hand, America had launched the atomic project sensing the World War II situation. Need arose for great scientists and good administrators. Compton was an obvious choice. This project was sanctioned in 1941 by the then president of America, Franklin Roosevelt on recommendation of foremost scientists of the time, Albert Einstein, Enrico Fermi and Leo Szilar. A core group of scientists was constituted and sufficient funds were allocated. Later on, some defense officers were also included in the team. The project was named Manhattan Project. On the assurance of Enrico Fermi, Compton took this responsibility. It was difficult to build a nuclear reactor. Finally, it was erected in the Chicago Football Stadium. From 1942 to 1945 he was director of the Metallurgical Laboratory at the University of Chicago, which developed the first self-sustaining atomic chain reaction that paved the way for controlled release of nuclear energy. Things worked as per the schedule and the atom bomb was tested successfully. Compton realized that this project could cause huge loss of human life and untold devastation. But he also saw it as a means to stop the on-going war. Ultimately, what followed came to be known all over the world. May be, personally speaking, Compton and other senior scientists may not have felt morally justified in conducting such a research. Thereafter, in 1945, Compton became Chancellor of the University of Washington and then professor of natural history there from 1953 to 1961. During the war, Compton was at the forefront of decision making process on several important science related issues. Many held him as one of those responsible for the atomic massacre in Japan. He believed that the radiation emitted at the time of nuclear fission is a natural process. The use of science for the benefit of humankind is indeed of the hour. He died at the age of 70 on Match 15, 1962, in Berkeley, California, USA.